Finding the right Christmas present seems to get more difficult every year. Have you thought of a gift experience? Something that your friend or family member can look forward to doing in the year ahead? If you’re looking for a gift experience in Dumfries and Galloway then maybe we have the answer! Going out for Afternoon Tea is popular with all age groups. It’s such a special treat! Here at Abbey Cottage, we love preparing our popular Afternoon Tea. 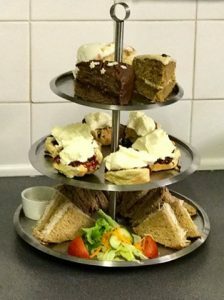 Brought to your table, the cake stand will include freshly made sandwiches with a choice of filling, home-made scones with cream and home-made jam, and a choice of cakes. You’ll also have a pot of your favourite variety of leaf tea and plenty of hot water. Wouldn’t you love to share this? Now you can! Our Afternoon Tea Gift Voucher is a Christmas gift that your friends or family can look forward to using in 2019. We’ve made it easy to order our Afternoon Tea Gift Vouchers online. When you go to the webpage just select the number of Afternoon Teas you would like to purchase, and payment is secure with Paypal. When we receive your order we’ll post the voucher to you. Or, if you like, we can post directly to the recipient with a message. If you’d like to do that, just leave the instructions when you order. Our Tearoom, Abbey Cottage and its neighbour, the beautiful Sweetheart Abbey. Our family owned Tearoom is right next to the beautiful ruins of Sweetheart Abbey. 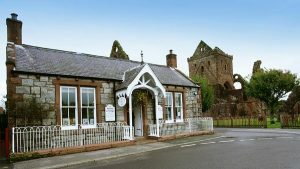 We’re just a few miles from Dumfries in the pretty historic village of New Abbey, and there is easy parking and access. It’s a great location for a day out, and we’re pretty sure that your friends or family will love it too! 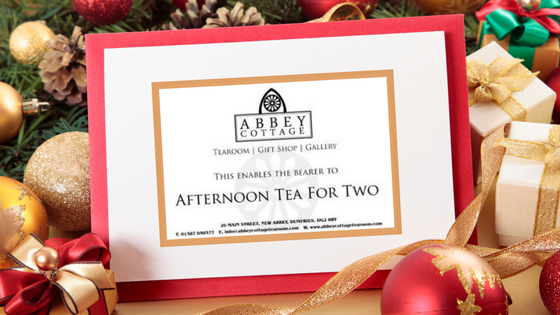 If you’d like any more information about our Afternoon Tea Gift Vouchers, or things to do in New Abbey, don’t hesitate to get in touch with us.